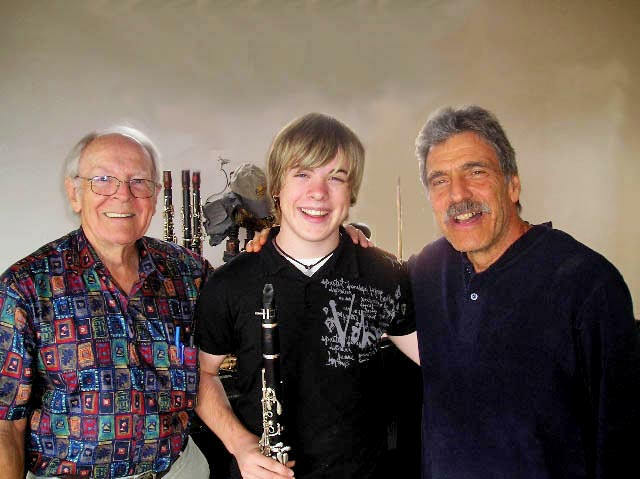 My grandfather gave me my very first clarinet lesson. It changed my life. And this year, after playing for nine years, my Granddaddy offered me the chance of a lifetime. He had been in touch with Eddie Daniels and asked me if I wanted to go with him for a week out to New Mexico for some private lessons with him. I was blown away – what an opportunity! I had never been to New Mexico before but I was so excited to go and play with Eddie Daniels himself! Though there was another emotion that started to build up inside of me on the plane ride there, and that was nerves. I know why I was nervous though. First of all, he’s a superstar in the clarinet world. And second of all, I remember someone telling me they had played with him before and said he has high standards for musicians. I was worried I might not be as good as he was expecting me to be. We arrived in Albuquerque, NM on Monday. The first lesson was going to be on Tuesday, but even though I had a day to go till then, the nerves intensified. We got our rental car and drove to Santa Fe. When we got there we found our hotel, relaxed a bit and then went to find Eddie’s house so we would know exactly how to get there. When we arrived at the gate, all I could think about was how tomorrow we’ll be here again and Eddie’s voice will be the one that will let us into the neighborhood. I was really excited! Then we went to The Olive Garden to get some dinner. After that we returned to the hotel and got some rest for the next day. On Tuesday, we woke up at around 7, ate breakfast, and went right back up to our room to practice before the lesson. I was practicing Carl Maria von Weber’s Concerto No.2, Movt.1 for Clarinet so that I could receive help from Eddie. Well after we practiced we got in the car and headed over to Eddie’s house. My heart was racing the entire way there. Eddie called us into the neighborhood and we began driving towards his house. It was really cool. It was like on top of a mountain and the roads had no barriers along the edges (that actually creeped me out a bit haha). But we finally arrived to his driveway and went to his front door and there he was, the man himself. Though I was nervous, he instantly calmed me down by treating me like a friend. The first thing he had me do was sight-read a duet with him. We finished and I only made 2 or 3 note mistakes. He said, “You read well.” which made my day. Then, I pulled out the Weber, played it for him and Eddie tore me to shreds and I loved it! I learned so much in that hour lesson. It was a great experience and I couldn’t wait to do it again. After the lesson we went back to the hotel and I practiced the Weber with all the hints he gave me. On Wednesday, we had the same routine as the morning before. We arrived at Eddie’s house and went right back to work. Instead of sight-reading first, we went into the Rossini Introduktion, Thema und Variationen. We listened to some other performers play the piece on CD’s and then we worked on it. Again, I learned a lot from that hour lesson. I was still a little star struck, though. After the lesson we went to Las Vegas….. in New Mexico haha. We drove quite a ways to get there. It was a small town but had a lot of history in it. We went to Fort Union which was a really neat historical sight. Then back to the hotel to get some rest for the next day. There was no lesson on Thursday but we did get to go to Taos and research about my great, great, great uncle Kit Carson. It was a lot of fun. My grandfather and I got to spend some good quality time together. We then came back to the hotel and rested up for the next day. On Friday we scheduled our lesson at 4 so my Grandfather and I could go to Los Alamos to learn about the Atomic bomb. Again, it was another interesting exhibit. Then we went back to Eddie’s for my third lesson. This lesson was more jazz oriented. He threw so much new stuff at me that I became uptight and embarrassed at the fact that I couldn’t grasp it as well as I hoped. I am thankful he did throw a lot of new things at me because I learned so much. He gave me many new exercises to work on that could dramatically change my playing for the better. But, if you want to know, them I suggest you go into his intensive program. Then, we went back to the hotel where I stayed up late practicing the new licks he taught me. I wanted to be able to prove to him the next day that I could play them well. Saturday morning I got right back to practicing for the final lesson. Then we headed over a bit earlier than the scheduled time of the lesson so my grandfather and I could watch Eddie teach Dave Anderson (another student). He taught Dave tenor sax. It was a delight to watch. Then we talked with Dave, took some pictures and got into my lesson. I started by playing the licks that I worked hard on. I think Eddie was pleased to see the progress. After that we worked on All-State etudes. Then we went to this place that Eddie suggested we eat at. It was great food for great prices. My grandfather and I really enjoyed it. We then went back to Eddie’s house because he wanted me to play something for his next student (which happened to be the Principal clarinetist of the Albuquerque Symphony. She was very kind and complimented me very sincerely. I was flattered he asked me to do so because I kind of felt like he was showing me off haha. Eddie also called Richard Hawkins (Professor of clarinet at Oberlin Conservatory of Music) about me and suggested I take a lesson from him before I decide where I go for college. He said Professor Hawkins is the best teacher in the country. So I’ll take his word for it haha. After I played for his student, we said our final goodbyes which were hard to do. I miss Eddie very much. He gave me without a doubt the best lessons I have ever received. Eddie Daniels is not only a phenomenal player, but a phenomenal teacher as well. I will remember that week for as long as I live. He’s kind, helpful, knowledgeable, talented (an understatement), and an overall great guy. I hope to see him again very soon.